Doesn't Yui have a nice living room? It's a good thing too, since we spend like five hours there. Summary: The X-Men spend an awfully long time sitting on the couch chatting, Sasaki Yui and Prof. X have one of the most patently ridiculous conversations I’ve ever seen in my life, and Wolverine takes a page out of Storm’s book and forgets what his powers do. I would say things are deteriorating fast, but they’ve kind of been deteriorating at a real steady rate all along, honestly. On the plus side, I didn't notice anything off with the visuals in this episode- actually, it seemed relatively well-directed, for a change. It just makes it even clearer that it's the writing that's the source of all the real problems here. 1. The writers still don’t seem to know what the characters powers do, which is a pretty unforgivable sin in a production like this-Wolverine doesn’t realize he can cut the Blackbird out of its restraints, because his claws can cut through ANYTHING? The X-Men discover that the Blackbird is being restrained by a mysterious substance called, oh wait it doesn't matter what it is because Wolverine's claws are adamantium. The whole rational for the X-Men being stranded and requiring the second Blackbird ONLY works if you think Wolverine is too dumb to remember how his powers work. He and Storm, they could start a club-within-a-club. 2. Even when the writers have a good idea, they mess it up with cliche dialogue. Emma and Scott having a heart-to-heart discussion about the emotional wreck he’s been since Jean’s death could have been the highlight of this series so far, but every line of dialogue was so obvious and cliche that it robbed the scene of any potential resonance it may have had. Lol, she's talking to CYCLOPS, tee hee hee. Oh Not-Emma, you're so cute. Scott is wracked with guilt over his lover’s death? This has been old news since five minutes into the first episode. Seriously. On another note, if the show decides to go in the direction of the Scott/Emma pairing, it will be interesting since this show’s version of Emma is so altruistic (and thoroughly un-Emma-like) so far that she may as well be Jean 2.0. Cheer up Cyclops, Jean’s not dead- she’s just dyed her hair and changed her stance on showing cleavage. 3. The characters are not keeping up with the viewers in terms of figuring things out. All viewers have had alarm bells going off in their heads about Yui and her camp from pretty much the first second they saw her, while the X-Men will only go so far as to say they’re “wary” of her. I feel like I’ve said this a billion times, but there’s no getting around it; they seem too dumb to live. A minor point, but in their quest to be sexist in every possible way, the writers have proved that they don’t actually know what “women’s intuition” is. If you put aside the 75% of it that’s pure myth, women tend to be better at reading facial expressions and body language than men- it doesn’t always break down along gender lines, as some men are very good at it too, but in general, more women than men have a gift for interpreting non-verbal cues. So “women’s intuition” comes into play when a woman can see that a person’s facial expression and/or body language belies something they’ve said or done- it’s not really intuition so much as a specific kind of analysis that women tend to be better at. So after claiming that Yui is lying, Emma chalks up her assertion to “women’s intuition”- and then provides entirely logical reasons that anyone who was paying attention would have noticed. Guys, Emma didn’t figure out Yui was lying due to analyzing nuances of her facial expression, she noticed she was lying because she’s the only one in this group who uses her brain ever. On a related note, Cyclops notes that Yui “seemed nice,” confirming our suspicions that Cyclops is the worst judge of character ever. 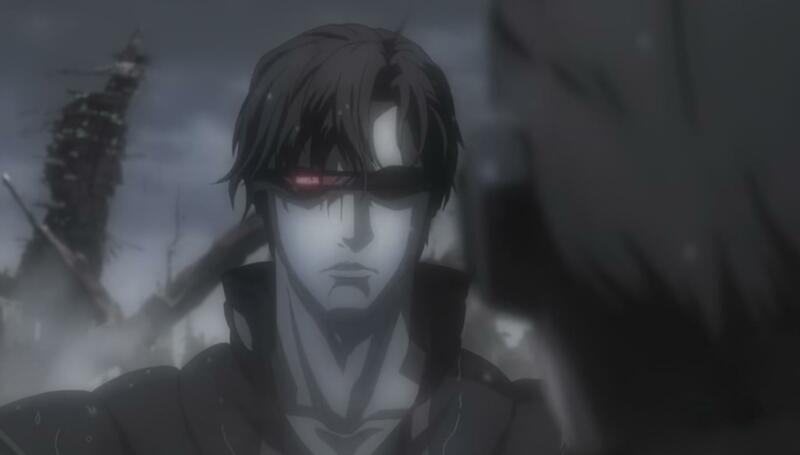 I have nothing to say about the battle scene, which was rather dull- I just wanted to point out that this guy looked like poor-man's Alucard to me. 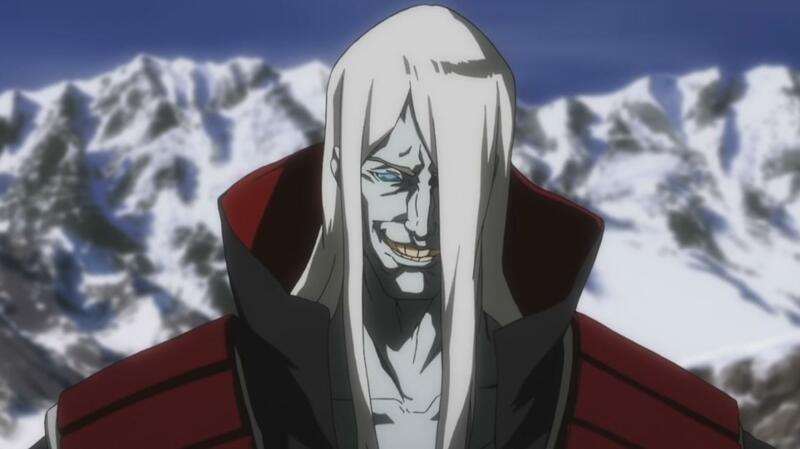 That's Castlevania-Alucard, not Hellsing-Alucard- Dammit! I could be watching Hellsing right now! This is a summary of the phone conversation that Yui and Charles have in this episode: I still can’t quite get over this. Yui: Just FYI, you have a son. Charles: What? I have a son? Charles: What? My son is dead? The son you just told me that I have three seconds ago? Where do I even start with that? Okay, I know the next episode is already out, but what can I say- I’m busy watching Stein’s;Gate and, God help me, SofuTenni- you know, anime with some redeeming value. Yeah, I just strongly implied that a Xebec fanservice show is better than X-Men, BECAUSE IT IS. I’ll watch episode 8 of this show the minute I can stand it again and not a moment sooner. 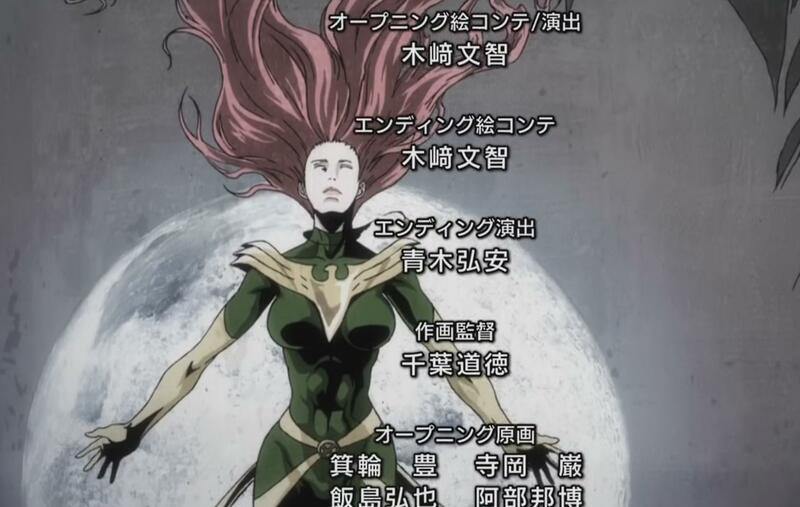 I've meant to comment on this for a while already: how messed up is this version of the Phoenix costume? It's not that I have an issue with them redesigning the costumes in general, but the Phoenix outfit is one of the classic superhero costumes- don't just go and add random crap to it for no reason! I’ve really enjoyed your reviews of the X-Men anime. it’s been really refreshing reading your crystal-clear breakdown of why this series is a trainwreck. oddly enough, i can’t stop watching it either. I really think the nerfing of the characters’ intelligence and powers is remarkable. it’s like these writers didn’t even feel like being imaginative when creating foes and obstacles for them to overcome. Storm is sooo booty in this series that it’s almost offensive. I suspect you might be over-analyzing what is, at heart, a children’s cartoon show. Try to put the old X-Men show from the 90s under similar scrutiny and you’ll likely find it falls apart as well. 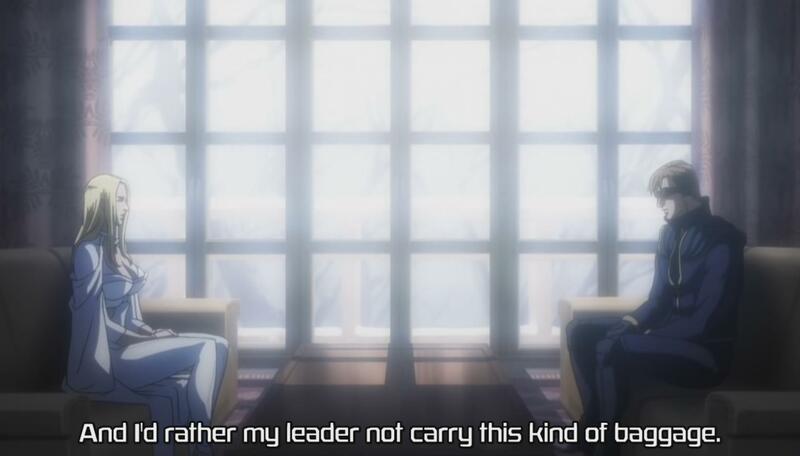 I thought this was one of the better episodes so far, good to see more character development instead of often rather pointless and boring fights. There will be more action in the next one though, don’t worry! @Nameless: Watching Scott get decked: the saving grace of Madhouse and Superhero Anime Partners:). @John G: I have to respectfully disagree with you there. I watched the first few seasons of the 90s cartoon fairly recently, and while that series certainly had it’s share of melodrama and cheesy dialogue, to me the writing made a lot more sense in general than it does on this show. Plus, if nothing else, the writers of that series knew who the characters were and what their powers did. Also, I’m not sure if this show is “a children’s show” in the same way that the FOX cartoon was- there’s an awful lot of cleavage and conceptual horror for that. If anything I think this show is targeted older, which makes the frequent logic-fail even less excusable for me. @Karen Sure, we might well disagree, but I still don’t feel your criticisms are entirely fair. 1. Wolverine getting the Blackbird lose from all that material seems a little too much even assuming he could slice through it effortlessly (which is not a given). It would also fall down and accrue further damage if he succeeds. 2. Storm not stopping the snow storm in the last episode is no error, natural weather phenomena in the comics have often been too large for her to affect to any significant effect as well. Depends on powerful the writers want her to be. 3. Emma catching Yui’s lying but not the others have a good explanation; in the previous episode she picked up the name “Sasaki Yui” from Xavier when they were mind-linked and was thus curious/suspicious of her directly when she found out who she was. The others did not know this and so did not pay as close attention to what she said or how she said it. 4. As for the Xavier/Yui conversation, you have to keep in mind that something is clearly disturbing Yui heavily (probably getting black-mailed by the villains in some way, maybe related to her son), so if she started rambling when pressed by Xavier that is entirely understandable I think. She probably also wanted him to know some of what she said, even though she might possibly get in trouble for it. If you aren’t current on the show, then this obulovsiy won’t match what is going on with the offices (not to spoil it but they have new offices).My guess is that the office stretches to the other side of the elevator bay (the time life building should have central elevators to maximize window space). Over there is probably where they keep all of their accountants, ad buyers, typists, records, etc. 1. It would have been better if that’s the explanation that we were given, but it wasn’t- as far as the characters were concerned, getting the Blackbird down period didn’t seem to be an option. I think there are a lot of things on the show like this where you CAN think of a plausible explanation, but there’s no indication that the writers intended it, or even thought of it. 2. This is something I hate about comics continuity and one of the main reasons I stopped reading superhero comics- sure, in all the 50,000 different portrayals of Storm out there, I’m sure you can find some where she hasn’t been powerful enough to do certain tasks. However, this portrayal is still at odds with most portrayals of the character I’ve ever seen. 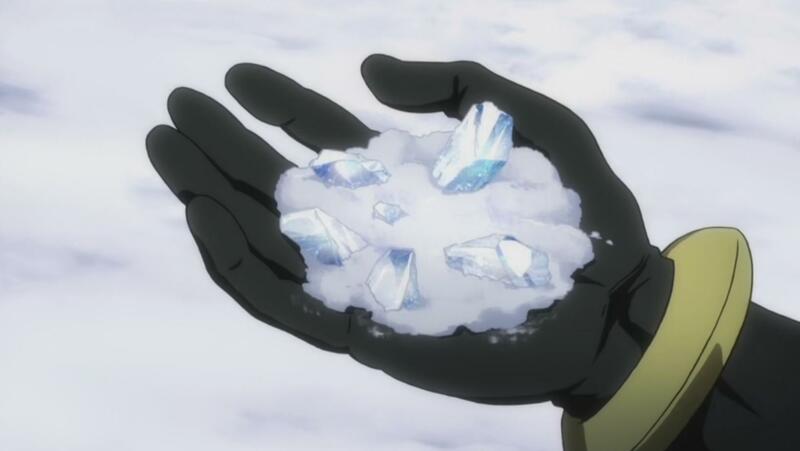 Also, that whole plot point was handled strangely- initially Storm says it “isn’t weather-related,” but later the X-Men ask Yui if she has anything that can melt snow (and Wolverine asks Storm if she can melt the snow at the site), so they clearly think it is weather-related, at least at first. Which is it? 3. 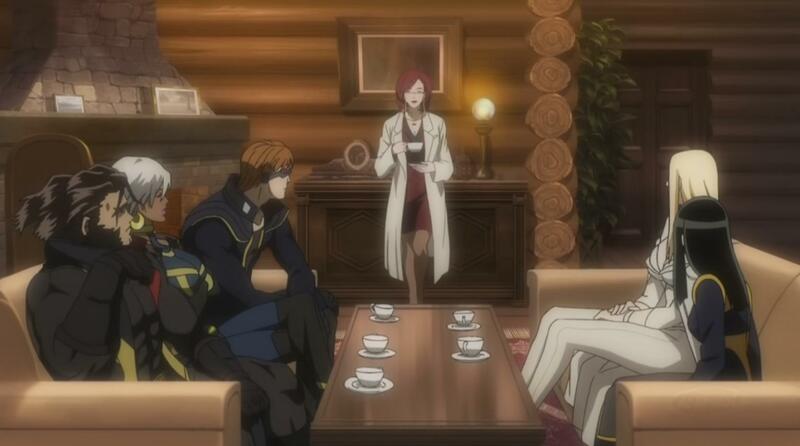 Given the situation the X-Men found themselves in, I think they should have been paying much closer attention to what Yui was saying than they appeared to- they stumble into this scientist’s domain, right in the middle of this area manifesting strange scientific phenomena that they’re specifically investigating, and they just nonchalantly drink her coffee and aren’t suspicious? I agree that Emma went in with more information, but everyone else should have been suspicious as well just by virtue of the situation. 4. The conversation may make sense in the story overall, but it does come off as inherently ridiculous melodrama- something that would be easier to let slide if the quality of the writing were better in general. I don’t disagree with you that Yui’s motivations for acting that way may be explicable, but it just came off as the piece-de-resistance of forced writing in the context of how this show has been presented. I think we could probably go back and forth on this for a while- it depends how much faith your willing to put in hypothetical explanations for things, as opposed to the explanations the writers actually give us. Thanks for commenting though, I appreciate seeing an alternate interpretation even if we disagree. That could be- I honestly can’t tell what’s supposed to be a joke on this show.